WILL THE FIGHTER GUN SURVIVE? During World War Two the fighter gun reached the peak of its importance, as at that time it was the only effective weapon available for air­to-air fighting. This period saw it developed to a dramatic extent, from the rifle-calibre machine guns which were standard at the start of the war to powerful automatic cannon of 20 mm to 50 mm calibre by the end. However, aircraft guns were increasingly challenged by missiles in the post-war period. At first, the moves to replace guns with missiles were premature, as the Americans discovered during the Vietnam War. Since the 1970s, the performance of air­to-air and air-to-ground guided missiles has improved dramatically, to the degree that it is frequently argued that there is little reason to fit guns to aircraft in the future. The Royal Air Force's initial decision not to use the Mauser BK 27 cannon in its Eurofighters is a sign of the times. Furthermore, only the United States Air Force (USAF) version of the Lockheed Martin F-35 Joint Strike Fighter (JSF) will have an internal cannon, the United States Navy (USN) and short take-off/vertical landing (STOVL) versions being available only with a gun-pod as an option. Although the Lockheed Martin F/A-22 Raptor does have an integral cannon, one senior staff member in charge of the project has since expressed regret about the decision. There is now a strong body of opinion which regards aircraft guns as troublesome and unnecessary. The cost of providing space and weight for the gun, acquiring and maintaining it, and keeping the pilot's skills up to date, are all cited. Vibration, resulting from gun firing, can affect avionics and cause structural fatigue, and propellant residues, which coat the aircraft are possibly corrosive. However, in spite of all this there are still good reasons to retain guns, as we shall see. Modern short-range missiles have minimum ranges as low as 300 m, well within gun range. They are also highly agile, with wide engagement envelopes, enabling them to hit targets well off bore-sight (the missile's centre-line), especially when cued by a helmet-mounted sight: in fact, the capabilities of most recent missiles are such that the aircraft carrying them barely need to manoeuvre. This does not mean that guns are useless for air-to-air work. They have a particular value in modern 'policing' applications, as they enable warning tracer shots to be fired in front of suspect aircraft. They also provide an economical way of engaging low value targets such as unmanned reconnaissance drones, transport and liaison aircraft, or drug-smugglers. In combat they still carry certain potential advantages in close-quarter fighting, for example in 'picking off' an enemy attacking a wingman who may be too close for a safe missile shot. The ability of modern fighters to adopt extreme attitudes, pointing well away from the line of flight, significantly assists gun aiming in dogfights. Cannon are instantly ready to fire, and their projectiles have a shorter flight time than a missile. Finally, the gun provides a last-ditch capability when all of the missiles have been fired, or if they are defeated by advanced countermeasures, or simply by circumstances. The 1991 Gulf War revealed the deficiencies of modern infra-red (IR) homing missiles when faced with trying to pick up a low-flying target against a hot desert background (helicopters being in any case difficult for IR seekers to lock on to from above). USAF Fairchild A-10 Thunderbolt II ground-attack aircraft achieved two helicopter kills with the GAU-8/A cannon, in one case when the IR missiles failed to lock on. Furthermore, the performance of even the best missiles cannot always be guaranteed. In Kosovo, a US fighter engaging a Serbian aircraft needed to fire three Advanced Medium Range Air-to-Air Missiles (AMRAAMs) to bring it down. In other engagements during the late 1990s, USAF and USN aircraft fired a total of seven AIM-7 Sparrows, AMRAAMs, and AIM-54 Phoenix missiles against Iraqi MiG-25 Foxbats without scoring a single hit (although the Phoenix shots were taken at extreme range). In part, the low success rates are due to tactical considerations, in that missiles may deliberately be launched outside the normal engagement envelope to distract or scare off the enemy, and sometimes two missiles are launched at one target to increase the hit probability. Whatever the reason, this results in missiles being used up at a high rate, making it more likely that they will run out during a sortie. A cannon will typically carry enough ammunition for several engagements, usefully increasing combat persistence at a minimal cost in weight and performance. Of the 1,000 kills or so achieved between 1958 and 1991, only a handful were scored beyond visual range (BVR), which raises questions about the significance of very long range missiles. It is sometimes argued that modern short-range missiles are so good that any aircraft with the benefit of long-range sensors and missiles should use them to try to stay outside the envelope of the enemy's short-range AAMs. However, it is not always possible to dictate the terms of an engagement. The Iranians made good use of the long-range AIM-54 in their 1980s war with Iraq, but the F-14s which carried it still found themselves engaged in gunfights from time to time. There is a continual battle between missile sensor and countermeasure technology. In the future, stealth technology applied to aircraft may considerably shorten target acquisition and combat ranges, putting into question the worth of modern BVR (beyond visual range) AAMs. The possible future use of anti-radar missile homing as a way of overcoming stealth characteristics may force fighters to make minimal use of their own radars, further reducing acquisition and combat distances. It may also prove increasingly difficult for either IR or radar-homing missiles to lock on to their stealthy targets, additionally protected by extensive electronic jamming and IR countermeasures. Modern guns are usually aimed by the aircraft's radar, which could also be jammed (though less easily than the much smaller and less-powerful missile seekers), but laser rangefinders could make an acceptable alternative in providing fire control data. If aircraft eventually become 'laser­proof' as well, the possibility presumably exists of linking variable-magnification optical sights to a computer which would be able to analyse the image, identity the aircraft, calculate its distance, speed and heading and provide gunsight-aiming information accordingly, all covertly. The emphasis in the use of aircraft guns has now shifted more towards air-to-ground work, although even this is becoming increasingly hazardous. The proliferation of anti-aircraft gun and missile systems, including man-portable air defence systems (MANPADS), means that even specialist ground-attack aircraft, fitted with powerful cannon, have found it safer to rely on the long range of their air-to-ground guided weapons rather than close to gun range, although the USAF's A-10s have still made good use of their cannon in recent conflicts. This trend is aided by the continued development of air-to-surface missiles, the latest ones having autonomous homing systems to provide 'fire and forget' capability over long ranges. Another current development is the General Dynamics Advanced Precision Kill Weapon System, which aims to achieve accuracy at low-cost by fitting a laser homer to the small 2¾ inch (70 mm) rocket. The target is to achieve a circular error probable of l-2 m at ranges of up to 5-6 km at a price of US$8-10,000; one-sixth the cost of a Hellfire anti-tank missile. However, not all conflicts involve front­line opposition: in fact, armed forces are now commonly engaged on police work, frequently dealing with guerrilla forces. In these circumstances, rockets and missiles may represent an inappropriate degree of destruction, with a high risk of collateral damage. The RAF was embarrassed during operations against insurgents in Sierra Leone in 2000 to find that it had no suitable weapon for its (gunless) BAE Systems Harrier GR.7s to attack small groups of rebels operating close to innocent civilians. Guns may also have value in providing the option to fire warning shots or inflict limited damage on land or naval targets in a display of determination. Another advantage of using cannon was demonstrated during the invasion of Afghanistan in 2002. Air support was called for during an intense infantry battle at Takur Ghar in late May, in which US forces were ambushed and in considerable danger. The Lockheed AC-130 Hercules gunship was not permitted to intervene in daylight due to its vulnerability, so USAF fighters were sent to help. For part of the battle the Afghan combatants were too close to the American forces for rockets or bombs to be used, so the fighters - Lockheed Martin F-16s and even Boeing F-15 Eagles - went in strafing with their 20 mm cannon, as have the Navy's F-14s and F/A-18 Hornets on other occasions in recent conflicts. Even RAF Tornados are reported to have carried out gun-strafing runs on at least one occasion. If an aircraft gun is still worth its cost and weight, should it be built in or added as a bolt-on gunpod when required? What type of weapon is best? What calibre should it be? Podded guns have an advantage in that they do not need to be carried unless the aircraft are in circumstances in which a gun is likely to be needed. Like any other piece of weaponry, they can be fitted according to requirements. The downside of this is the need to make sure that the gunpods are available when required. This needs careful planning and an element of luck. They occupy a hard point which would otherwise be available for fuel or other weapons, they take some time to harmonise - and keep harmonised - when fitted, and even then they are less accurate than integral guns. Gunpods generate more drag, usually affect handling, and are also much less 'stealthy' than integral guns - a factor likely to increase in importance as the growing use of stealth measures is leading to the internal carriage of all weapons. The gunpod is therefore very much second-best. There are three competing philosophies when it comes to gun design for fighter aircraft. One is the US multi-barrel rotary in the form of the classic M61, now in A2 form in the F/A-18E/F and F/A-22: despite being fast-firing, it is only 20 mm in calibre, and a very bulky system. This is supplemented (mainly for ground attack) by the use of the five-barrel 25 mm GAU-12/U, fitted as a podded gun attached to the USMC's McDonnell Douglas AV-8B Harrier II. A four-barrel version of this gun, the GAU-22/A, is to be fitted internally to the Air Force Lockheed Martin F-35A Lightning II and as a gunpod to the STOVL F-35 and naval F-35C. The seven-barrel 30 mm GAU-8/A is the most powerful aircraft gun currently in service, but, together with its ammunition magazine and feed, it is so large and heavy that its only user, the A-10 close-support aircraft, had to be designed around it and it cannot be considered as a general­purpose aircraft gun. A smaller version firing the same ammunition, the four-barrel GAU-13/A, is available only in the GPU-5/A gunpod, but the vibration of the powerful gun has been proved to significantly degrade its accuracy. The second approach is the West European preference for a 27 mm – 30 mm revolver cannon, with multiple firing chambers but a single barrel. For many decades the standard weapons have been the French and British twins: the 30mm DEFA/GIAT and Aden revolver cannon, directly derived from the Mauser MK 213 under development at the end of World War Two, and fitted in various forms to a wide range of aircraft. The GIAT was also developed further in South Africa as the Vektor 55C5, but this did not enter production. A larger and appreciably more powerful option was the 30 mm Oerlikon KCA, fitted only (in a conformal pod) to fighter versions of the Saab Viggen (now out of service), but also available in a detachable gunpod. In terms of muzzle energy; this is still the most powerful fighter gun: the GAU-8/A 'tankbuster' ammunition was developed from it. Later still came the 27 mm Mauser BK 27, a good combination of compactness, hitting power and high rate of fire. Its qualities led to its selection by both Boeing and Lockheed Martin for the JSF competition, but the choice for the winning F-35 was subsequently switched to the GAU12/U before the GAU-22/A was finally chosen. The most recent development is the GIAT 30M791, so far intended only for the Dassault Rafale. This combines a powerful new 30 mm cartridge with a very high rate of fire. For the sake of completeness, it should be mentioned that the USA made one revolver cannon which saw considerable use in the 1950s - the M39, which fired the same 20 mm ammunition as the M61. It was eclipsed in the 1960s by the M61 and by now would have been long forgotten if not for its use in the F-5 lightweight fighter, still in service in some numbers. The third philosophy, adopted by Russia, is a variety of light and compact weapons (the penalty being a relatively short life). Their principal fighter gun (designed, like all of them, by the partnership of Gryazev and Shipunov) is the 30 mm GSh-301 as used in the MiG-29 Fulcrum and Su-27 Flanker families. This has a remarkable performance considering it uses an 'old-fashioned' single-chamber short-recoil operation, similar in principle to the Browning machine gun of World War Two. It matches the BK 27 in performance, but weighs only half as much. The twin-barrel GSh-30 also deserves mention, despite not having been used in fighters, being restricted to the Su-25 Frogfoot attack aircraft (and, in long-barrelled GSh-30K form, to the Mil Mi-24P Hind combat helicopter). At 105 kg it weighs about the same as the Western fighter guns, but fires at up to 3,000 rpm. It was originally intended to be fitted to the MiG-29 and Su-27, until displaced by the GSh-301. Finally, the third gun to use the same powerful 30 mm ammunition is the six-barrel rotary GSh­6-30, which differs from the American rotaries in being gas-operated rather than externally powered, giving it a faster 'spin-up' time. This was also restricted to ground attack, in the MiG-27 Flogger, though in comparison with the GAU-8/A is considerably lighter and more compact, being not much bigger or heavier than the 25 mm GAU-12/U. The battering this powerful gun gave the relatively light MiG-27 caused many problems, however, and it is no longer in service (see THIS article). The Russians also use two guns in the much less powerful 23 mm calibre: the twin-barrel GSh-23 and the six-barrel rotary GSh-6-23. The GSh-23 is one of the classic aircraft guns, having been used in a wide variety of aircraft since emerging in the late 1950s. By comparison with its Western equivalent, the M61A1, it fires only half as fast, but it weighs less than half as much and is far more compact. It has recently been modified in the Czech Republic to use American 20 mm ammunition; the resulting ZPL-20 is available only in a gun pod. The gas-operated GSh-6-23 has seen relatively little use, being installed only in the MiG-31 Foxhound and the SPPU-6 gunpod. However, it sets the world record in rate of fire for an aircraft cannon of no less than 9,000+ rpm, and is considerably smaller and lighter than the M61AI. An interesting comparison can be made between the two principal Western fighter guns, the M61A1 and the BK 27. The rotary clearly has the advantage in rate of fire, but it fires much smaller and lighter shells. Another difference between the two is that the externally-powered rotary gun takes time to spin up to its maximum rate of fire, whereas the revolver has an instant response. In the first 0.5 second, the M61 fires 18 rounds totalling 1.8 kg: whereas the BK 27 fires 14 rounds weighing over 3.7 kg. In the first second, the M61 fires 68 rounds weighing 6.9 kg, the BK 27 fires 28 rounds weighing over 7.4 kg. In weight of fire, as well as the destructiveness of the individual projectiles, the Mauser clearly has an advantage, albeit one that the faster-accelerating M61A2 reduces somewhat. This is significant in that dogfights frequently permit only the briefest of firing opportunities, and although a skilled pilot anticipating a firing opportunity can 'spin up' a rotary in advance, such notice cannot always be guaranteed. The Mauser projectiles are also heavier, which means they will retain their initial velocity out to a greater range. Incidentally, the choice of an even heavier projectile fired at a moderate velocity for the Russian 30 mm guns implies that ground attack has a higher priority than aerial combat in Russian strategy. The ideal gun for aerial combat will, of course, combine the best of all worlds: a high rate of fire, instantly achieved; a high muzzle velocity to minimise flight time; and projectiles large enough to inflict serious damage with each hit (requiring a calibre in the 25 mm – 30 mm range). The optimum weapon among those currently developed may well be the new GIAT 30M791 revolver, although its weight means that two GSh-301s (or a GSh-30) could be carried instead, with a higher rate of fire. 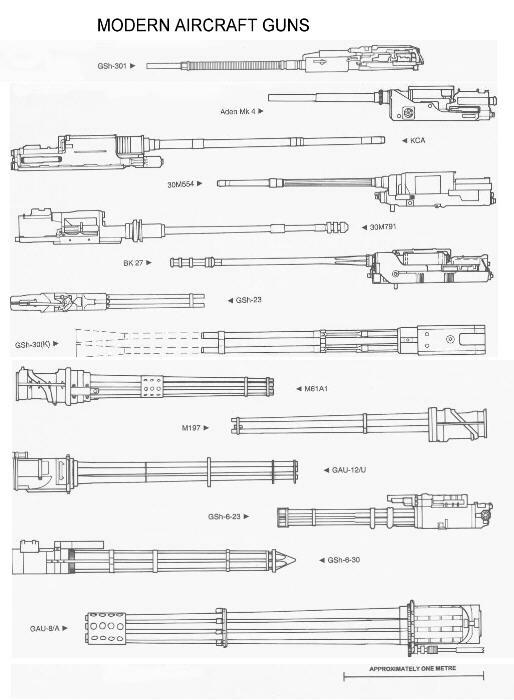 If the Russian guns' 30 x 165 (shell diameter and cartridge case length in mm) ammunition were loaded with lighter projectiles for a higher muzzle velocity, their aerial combat capabilities would be improved, at the cost of some loss of ground attack effectiveness. For general ground attack (as opposed to 'tankbusting'), the Russian 30 x 165 round is ideal, and there are three weapons capable of firing it, with one, two or six barrels. Which is best depends on-the limitations on weight, space and 'recoil management' of the aircraft concerned. All the weapons so far described represent conventional, if not rather old, technology, The USAF has been exploring new technologies for aircraft guns under various programmes ever since World War Two. The 25mm GAU-7/A, firing combustible-cased telescoped ammunition (CTA) and originally intended for the F-15, was a technical failure but the concept has reappeared in a new range of CTA weapons under development in both the USA and Europe. Most attention is being paid to armoured fighting vehicles guns in 40 mm – 45 mm calibre but a 20 mm aircraft gun project has also featured. In the 1980s, the USAF Advanced Gun Technology programme led to a General Electric design for a five-barrel, 20 mm gun with less than half the number of parts of the M61. The gun weighed 102 kg, had a maximum firing rate of 6,000 rpm and a muzzle velocity of 1,525 m/s, a speed which provides the potential to achieve a huge increase in hit probability. Another advanced development might conceivably include the adoption of Oerlikon AHEAD (advanced hit efficiency and destruction) technology - time-fuzed shrapnel shells which shower the target with a shotgun blast of tungsten-alloy sub-munitions. A simple version of this is already in service for ground attack in the Russian CC projectiles, but its application to air combat would involve resolving some difficult fire control problems in that the time fuze is set electronically at the muzzle to detonate the shell just ahead of the target. If, in the future, guns were to regain some of their importance in air combat, there are technologies available which could significantly improve the hit probability. An example is the 'closed loop' control system used in the naval Phalanx close-in weapon system, in which the gun-aiming radar also tracks the projectiles in flight, calculating whether they will hit the target and adjusting the aim if not. Applied to an aircraft, this could operate in three ways: the aim could be adjusted by steering the aircraft (linking gun firing to a transfer of flying control to the flight control system), by steering a flexibly­mounted gun (the Soviets were keen on this in the 1950s, but with only manual aiming it was too cumbersome and would not be very stealthy) or by steering the projectiles (course-correctable cannon shells were demonstrated decades ago, using small charges around the circumference of the projectile to alter its trajectory). Looking further ahead, the possibility exists of using electromagnetic rail guns, which use a powerful pulse of electromagnetic energy to accelerate a projectile to velocities higher than any chemical propellant can achieve. However, some fundamental technical breakthroughs would be necessary to make this feasible in an aircraft weapon. Work on airborne lasers is also proceeding. Initially these will be huge weapons carried by large transport aircraft for destroying ballistic missiles during their ascent phase, but fighter installations are also being considered. Raytheon is working on solid-state lasers for this purpose, with the possibility of using fibre optics later. The original aim was to mount such a weapon on the F-35 by 2010. The beam could be steered by mirrors in any direction, potentially a very valuable ability in a dogfight. Such a system could conceivably also be used to provide an anti­missile self-defence capability for the fighter. However, a laser is susceptible to atmospheric conditions and, no doubt, countermeasures will also be developed, perhaps involving ablative coatings which not only absorb the heat of a laser strike but produce a highly-reflective surface when hit. These approaches are all years - if not decades - away from being ready for service use. Until then, the versatility in the kind of targets which can be engaged, flexibility (in terms of a progressive response from warning shots up to destruction), the lack of susceptibility to atmospheric conditions, stealth technology and countermeasures, and the low cost of gun munitions, all combine to make the retention of the aircraft gun a strong probability for the foreseeable future. Some recent decisions – namely, that the BK 27 will, after all, be carried by all RAF Eurofighters (initially set up only for ground attack), indicate that this has been recognised.